It’s back to the series on land sightings of the Loch Ness Monster and the curious case of Margaret Munro. Before I start, recent comments on the cryptid believers on the Internet would suggest I am somehow about to preach a sermon from the book of Genesis. Since these cases are dismissed and treated like ancient texts, this is no surprise. However, this case happened in the lifetime of my own father ... not thousands of years ago and even sceptical Loch Ness researchers admit she saw something. The question is what did she see that summer morning nearly 80 years ago? Having done battle with the creationists, the sceptics are now turning their sights on cryptid proponents. Let’s see how they have typically applied science and critical thinking to this case. The Munro case is well known to Nessie followers and has its place in the various text books. To get right back to the original sources, the story from the Inverness Courier of June 5th 1934 is shown below (click on the images to enlarge). The next story was recorded by Dom Cyril Dieckhoff under date 5th June 1934: Margaret Munro, daughter of Dan the Miller and a native of Fort Augustus, was maid to Mr. and Mrs. Pimley, Mr. Pimley being a master on the staff of the Abbey School and living at Kilchumein Lodge, (close to the Abbey turbine house). The Lodge overlooks Borlum Bay and one Sunday morning Miss Munro was looking out of a window at about 6.30 a.m. On the shore of the Bay she saw, as she put it, the biggest animal she had ever seen in her life. Using binoculars she observed that the creature was almost, but not entirely, clear of the water. It was 300 yards away and she watched it for twenty-five minutes, from 6.30 to 6.55 a.m. Asked afterwards why she did not wake Mr. and Mrs. Pimley she said that, being new in their service, she did not care to, as it was so early in the morning. Her description runs: 'Giraffe-like neck and absurdly small head out of all proportion to the great dark-grey body—skin like an elephant—two very short fore-legs or flippers clearly seen. The animal kept turning itself in the sunshine and at times arched its back into one or more humps.' Finally, 'it lowered its head, quietly entered the water and disappeared'. Soon after 9 a.m. Mr. and Mrs. Pimley went down to the beach to examine the spot. There was a slight impression on the rather heavy shingle and in the centre a small branch had been pressed into the gravel. Before this experience Miss Munro had not believed in the Monster. The story quickly gained traction as it appeared in the national Scotsman newspaper the next day and over the summer weeks we see the story being printed in various international newspapers. For example, I have a clipping from the distant Straits Times of Singapore for July 7th. It had to be said also that the story itself has been accurately transmitted across geography and time by the newspapers I have examined. The provenance of the story is a bit unclear. The master of the house, Mr. Pimley, worked at Fort Augustus Abbey School as a French teacher and it is likely that he would have taken Margaret Munro the short distance to speak to Cyril Dieckhoff. It is to be noted also that Mrs. Pimley had a sighting of the creature back in the previous November. His diary entry looks much like the Courier report but there are minor differences. Peter Costello in his "In Search of Lake Monsters" lifts his account from Dieckhoff’s diary but erroneously states we would have lost this story if he had not entered it into his diary. As just demonstrated, the story was international news. I would suspect that the Courier is a collection of statements from various individuals (Munro, the Pimleys and perhaps Dieckhoff's expertise) and edited into one article. The article was probably composed by Alex Campbell, who lived in Fort Augustus, but I cannot be sure. The fact that Dieckhoff’s diary entry tallies with the newspaper account adds to the accuracy of the story. The story itself has been examined in different ways by Loch Ness researchers over the years. Most books just recount the story in a narrative way whilst others attempt further interpretation. We have already mentioned Costello and Whyte but Nicholas Witchell’s The Loch Ness Story adds further details in that he carries a sketch of what Margaret Munro allegedly saw as well as a photograph pointing to the probable location of the creature. The location photograph is below while the sketch of the creature is at the top of the article. The provenance of the sketch is unknown as Nicholas does not state if Margaret Munro was involved in its creation. It seems clear to me that he did not meet her because she is not directly quoted like other witness accounts and so I suspect the drawing was originally obtained by earlier researcher Constance Whyte (the one argument against this is that the sketch does not appear in her own book More Than A Legend). Naturally, sceptics took a different view. Steuart Campbell is his book The Loch Ness Monster - The Evidence files it under the Otter category (probably because the account mentions a white breast). I know Adrian Shine favours the seal interpretation because he showed a slide at a recent conference expounding that view. Ronald Binns and Tony Harmsworth make no mention of the case but Maurice Burton makes comments which I shall refer to later on. So with this background in mind, I revisited the location to get a sense of what might have happened. Borlum Bay and its beach are not particularly difficult to access. I parked near the house Margaret Munro worked in and cut across a field to the beach. Once on the beach, it was easy to see how a large creature could take to land here but also be fairly well hidden from public view. On a general scan of the area, I could only see one other house that could have been party to this event (but on reflection, I doubted they would have seen anything). The local town of Fort Augustus is well out of the way, though I imagined a keen eyed resident at the nearby Abbey with binoculars could in theory have seen something. However, at six in the morning, not many are going to be up and about. The first thing was to look at the location of the sighting marked in Nicholas Witchell’s book. It was at this point that I ran into a problem. The photograph below demonstrates this issue. My able assistant in the picture is not far short of six feet tall and is standing on the shoreline. Note how his head is almost on a line with the top of the grassy bank. This implies that it would be impossible for Margaret Munro to see where water meets beach as stated in the account. In fact, if the creature was no more that six feet high from flipper to crown of head, I doubt much more than the head and neck would be visible from the house. That is demonstrated by the two pictures below. I stood and took a picture of the house from the shore and then crouched down to above three feet above the beach and took the second picture. The house disappeared from view which means the creature would largely disappear from view as well from the viewpoint of the house. My own take on this is that Nicholas Witchell’s book is just making an educated guess as to where the location of the creature was. Dieckhoff’s diary entry states the monster was 300 yards away but the Courier is more accurate in stating it was the bay itself that was 300 yards away. This location problem is solved by taking a closer look at the original account. The Courier report says that the location was some yards west of Atlan Doer Burn. A burn is a Scottish name for a stream and there is no stream flowing into the bay at the proposed location, but there is one further along by the name of Alt Na Dubhair which is shown below on a contemporary Ordnance Survey map with a white arrow. So it would seem that Altan Doer Burn is a mangled transliteration of Gaelic to English probably lost in the ear of the Courier desk as the story was dictated over the phone. Since this side of the loch is referred to as the south side, then "some yards west" would put it a little further down the bay towards our witness. How does all this look on Google Maps? The first picture is the Google satellite view of the Pimley's house. 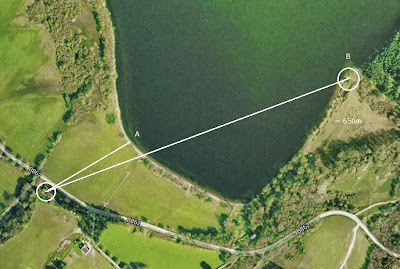 The second is where the Witchell location is (A) and my proposed new location (B). I estimate the new distance to be about 650 metres as opposed to the old one of over 200 metres. But Margaret Munro had the advantage of using prismatic binoculars. Evidently, her employers wisely kept them by the window in case Nessie put in an appearance in Borlum Bay. What the magnification of the binoculars was is guesswork, but powers of 6x, 7x and 8x were commercially available. Taking the middle value of 7x would make the creature appear as if it was less than 100 metres away to the naked eye. Combining this with the fact that the creature was under observation for twenty five minutes makes this one of the clearest observations of the creature in the sightings database. Standing outside the house where Margaret Munro sighted the creature, I took the following picture in the general direction of the burn. Zooming in the fashion of a pair of binoculars with my digital camera expands the detail to the viewer. Note the various visual cues that aid estimation of size. This zoom will be bigger than 7x but I doubt it still conveys what the more accurate human eye plus binoculars can convey to the brain at the scene. The light conditions were described as "bright sunshine" which agrees with the sunrise time for that location. The sun had risen two hours earlier and by 0630 was coincidentally along the path of the sighting (yellow line on map below). By then the sun was at an elevation of about 12 degrees which was five degrees more than the highest point along Margaret Munro's line of sight. So I would say that Miss Munro saw her creature in a degree of shade but in the context of a bright sunny morning, I doubt this hindered observation. Look around your own neighbourhood two hours after sunrise and note the adequate light levels for yourself. "Describing the animal to our correspondent, who drew a sketch of it from her description ...."
I had not seen this picture before in any publication, so it is possible this is the first time this image has appeared in nearly eighty years! The Witchell sketch is shown again for comparison. The two images are not too dissimilar. The Scotsman sketch has a slightly larger head and less square forelimbs. But which one is more representative of what Munro saw? We know the Scotsman sketch is not a direct sketch by the witness, but it is unclear whether the reporter and witness were even in the same room when he drew it. I myself tend towards the Witchell sketch as its head agrees best with the witness' statement about the "absurdly small head". Proponents of the Loch Ness Monster tend to print the account with not much in the way of further thought, but some add further observations. As mentioned above, Witchell attempts to pin down the actual location while Costello in "In Search of Lake Monsters" takes notes of the arching of the back into humps. It is also to be noted that the creature was not fully on land. The Courier report states that “only a portion lay clear on the water” while Cyril Dieckhoff states it “was almost, but not entirely, clear of the water”. The implication is that the creature was partially sitting in the shallow waters of the bay and did not fully venture onto land during the sighting. I would guess the water depth was about one or two feet reading between the lines in the account. This accounts for the lack of information on any rear limbs normally associated with the creature as they were still under the water. This all suggests that the creature was partly facing the woods with its back to the loch at some angle. I find the phrase “the animal kept turning itself in the sunshine” rather curious. What does it mean? Was the creature displaying a trait reported in other land reports where it has been seen to swing its head-neck structure from side to side? Perhaps, or was it actually turning its entire large bulk from side to side as if to capture the sunshine? One could even surmise it was rolling but surely if the entire body was being manoeuvred in these ways, then Margaret Munro would have had more to report about the rear parts of the body as they were hauled into view? In that light, I tend to the view that she is only referring to the neck. I, myself, would not consider the Loch Ness Monster a sun-bather as the Courier suggests. This is a creature that spends most of its life in darkness. If it had a penchant for seeking the sun, we would see it a lot more often basking in full view of tourists and locals. But why it would be on land at all more likely lies in another reason to do with more basic needs such as food. One wonders if it was actually searching for something in the trees - a tasty goat perhaps? But how big was the creature? Sadly, the normal estimates are not to be found in this account. All we have is the statement “the biggest animal she had ever seen in her life”. Since the monster and its brood are normally reported in a range of large sizes, this could mean anything up to perhaps forty feet. If Margaret Munro had seen the elephants that visited Inverness the previous summer as part of the Bertram Mills Circus, then she is talking about something bigger than an elephant. However, it should be clear that her statement is not meant to imply a rather less imposing otter or seal! The Pimleys' visit to the spot afterwards would indeed suggest something large. Creating a depression in heavy shingle is not an easy matter as I tried it myself! The depressed branch at that spot does add some corroboration to Margaret Munro’s story of something larger than the known animals around Loch Ness. As an aside, if I was Arthur Pimley, I would have taken the stick away as a souvenir. I wonder where it is today amongst Mr. Pimley’s descendants? The lighter underpart of the creature has been reported in other sightings and the dark grey skin is almost canonical. I think Maurice Burton errs on this point when he discusses the case. He relates how he took out his own 8x binoculars to examine a tree in his back garden at a range of 220 yards and said he could not make out the bark detail. He thus reasons that Margaret Munro could not claim to talk about the skin being like that of an elephant. I do not think this is relevant as no report I have looked at states that the texture of the skin was like that of an elephant. Rather, they merely state the skin was like that of an elephant in the matter of colour and not texture. That is suggested from the text when it refers to a dark grey colour but not to any texture. As to whether an elephant's skin texture can be discerned from an effective distance of 100 metres, I'll leave that until I come across one in real life! Margaret Munro's mention of the back arching into humps is important from a monster point of view as fluctuating humps are normally dismissed by critics as nothing more than witnesses being fooled by standing waves or similar changing shapes as they wash along the loch. Clearly, that explanation does not apply here. Transforming humps are one of those features well known to Loch Ness Monster researchers and a point of controversy as to their utility. The question that crossed my mind was whether this story was the first reported instance of such a phenomenon. The answer is "almost". I took the liberty of perusing my clippings collection up to the Munro sighting to see if any mentioned this hump fluctuation and found one report. "Twice it flattened out itself, then, apparently contracting, resolved itself into two humps, each nearly as big as an upturned boat, and several feet of water separating them." Eventually the object submerged with scarcely a ripple a mile away ... in Borlum Bay. Could this be the same creature that Margaret Munro saw three days later in the same locality exhibiting the same back flexing feature? Sightings of the creature are rare and it is even rarer to have "back to back" (excuse the pun) instances of metamorphosing humps. In fact, so rare as to suggest this was the same creature. As an aside, there was a sighting of the creature the day before John MacDonald's experience (Wednesday) by a Miss Fraser and others who saw an almost mirror image of his sighting but without the flexing humps. Their sighting saw the monster appear in Borlum Bay and then trace a route to a point between Cherry Island and the old Railway Pier. Mr. MacDonald saw the reverse route. It was almost as if the creature had submerged in front of Miss Fraser and stayed there until the next morning to resurface in front of James MacDonald. Curiouser and curiouser. It is tempting to think this was the same creature which opens up various lines of speculation. For example, does this show that the creatures tend to "hang around" certain areas? This would be consistent with a restricted food supply that does not encourage high mobility activities. Or perhaps it indicates territoriality as certain individuals avoid each other? Yes, I know, it's speculation, but that is part of the warp and woof of Loch Ness (on both sides of the debate, I may add). Mr. MacDonald's sighting was chronologically before Margaret Munro, but the story was not made public until the same day as Munro's story when it was printed in the same edition of the Inverness Courier. So, it can be argued that Munro's story receives corroboration in two areas - the MacDonald story and the beach inspection by the Pimleys. But such arguments will not convince or even sway everyone. One claim is that Margaret Munro merely saw a seal. At the Edinburgh "Nessie at 80" symposium last April, Adrian Shine presented a talk on Loch Ness and the monster. One slide showed our top of the article sketch and below it a similar black and white sketch of a seal drawn in such a way as to strike a similar pose. Though not indigenous to Scotland, the sea lion below exemplifies the suggested pose. But there are various problems with this interpretation. Firstly, it could hardly be suggested that a seal was "the biggest animal she had ever seen in her life". Grey and Harbour Seals are found around the Scottish coastline and can grow up to seven and six feet long respectively, though a typical specimen would be at least a foot smaller (I would also respectfully disagree with one website calling the Grey Seal the largest living carnivore in Britain, that would be Nessie!). In that respect, Adrian Shine's seal-monster slide was somewhat disingenuous in presenting his seal as almost as big as the Munro creature. 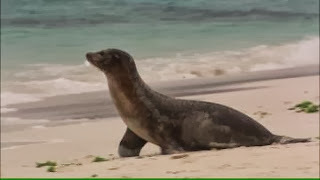 Could Margaret Munro mistake a seal for a much larger creature even after observing it for 25 minutes at an effective distance of about 100 metres? Could this lady who had spent years in Fort Augustus and must have visited that area countless times be so unfamiliar with the long standing visual cues around the bay which would act as size markers? I don't think so and therefore I think the burden of proof lies with those who suggest a seal. The second problem is that seals are not indigenous to Loch Ness. They do occasionally visit the loch but it is unlikely that there was a seal in Loch Ness at that time. Why do I say that? Because a seal being found in Loch Ness would have certainly made the newspapers. One reason I say that is because a search of the digital and microfilm archives show various reports of seals being seen in and around Inverness - including the River Ness. They usually ended up getting shot due to being a threat to the salmon stocks. For example, I found a report of a seal in the River Ness from the Northern Chronicle of the 6th September 1933. However, I did not find a report of any seal in Loch Ness up to and including 1934. If a seal did get into Loch Ness, it is not going to be there for long before it is spotted by people around the loch and it will most likely again be shot. Indeed, it is debatable whether the seal would get out of Loch Ness. Monster advocate and water bailiff, Alex Campbell, said he had never heard of a seal in Loch Ness and you would expect him to be the first to know about such a thing. But we have reports of seals n Loch Ness in recent decades, so was Campbell lying? I don't think so and I think it has to do with changing ecology. It is well known that fish stocks have been dropping for decades. As fish numbers around the Moray Firth drop, so the likelihood that they are pursued by seals into the Ness water system increases. It is my contention that seals hardly ever attempted a loch visit eighty years ago because there was no reason to - there was enough fish in the sea. With dropping fish stocks, we are now seeing hungrier seals taking more risks in chasing fish into Loch Ness. Thirdly, the sea lion pose above is hardly the standard pose of the seals under discussion. If you observe a sea on land for up to half an hour, then the most likely posture is the one below or reclining on its side. 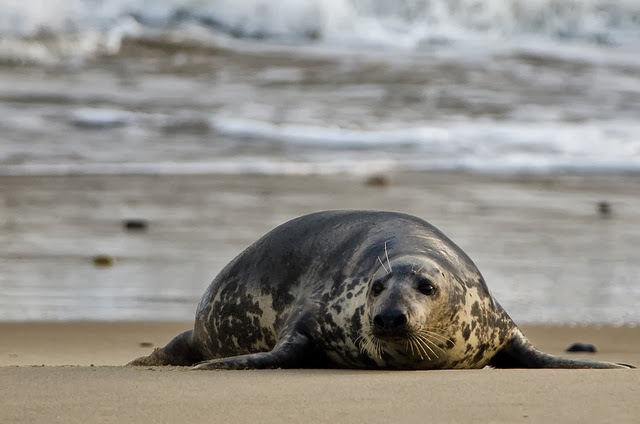 The raised posture is more associated with movement and our creature not only did not move its bulk but was very un-seal like in its appearance. Long neck, absurdly small head, back arching into humps, so how does one read "seal" into that unless the alternate explanation is unpalatable? I think Margaret Munro had an encounter with the Loch Ness Monster that summer morning in 1934. Talk of seals and smaller creatures such as otters do not stack up. In that case, the sceptics can only fall back on the liar hypothesis. But why would Margaret Munro lie? What were the psychological blocks? One major block was her own statement to the Courier that she had been in the Pimleys' employment for only a short time. Why ruffle the employment waters with this tall tale? Why further wind up her employers by saying she didn't wake them up to see this fantastic sight? It doesn't add up and the Margaret Munro story goes down as one of the most intriguing Loch Ness Monster tales to grace the eighty year old legend.